BUY ANY 2 ROOT WRAPPED ROSES AND THE 3RD FREE. Climbers are more structured and can be pruned back to produce growth on current years wood. Ramblers, however, flower on wood produced in the previous season so this growth has to be retained to ensure plenty of flower is produced. Despite this, ramblers need to closely checked and every so often a drastic thinning of growth is essential. Salmon pink buds, opening to large coppery-pink, almost double flowers with an exceptionally strong perfume in June and July. An unforgettable sight when in bloom. A strong grower needing plenty of space. (Bred by Barbier, France 1921). Rose, Ali Baba (Rosa Ali Baba). Double, glowing salmon-peach blooms with wonderful fragrance in groups of 5 to 10 on red stems. Repeat flowering. Healthy mid-green leaves. Rose, Bridge of Sighs (Rosa Bridge of Sighs). Abundant, large, semi-double, coppery-orange blooms from May to November with strong honey fragrance. Healthy dark-green foliage. Rose, Dancing Queen (Rosa Dancing Queen) (Fryfeston). Stunning double pink, lightly scented, large blooms are produced in abundance during summer to autumn. Vigorous with glossy foliage. Rose, Dizzy Heights (Rosa Dizzy Heights) (Fryblissful). Large, full, perfectly formed blooms, rich glowing scarlet with good fragrance, on long, strong stems. Shiny, dark green disease resistant foliage. Rose, Etoile de Holland (Rosa Etoile de Holland). Superbly perfumed, beautiful velvety crimson-red blooms all summer. Excellent for cut flowers. Dark green leaves. Rose, Gardener's Glory (Rosa Gardener's Glory). Continuous waves of large, bright golden-yellow, strongly fragrant flowers. Disease resistant, easily trained stems with shiny glossy foliage. Rose, Gloriana (Rosa Gloriana) (Chewpope). Clusters of 3-5 striking mauve to dark pink double blooms with light, sweet musky fragrance almost cover the plant all summer. Healthy neat foliage. Rose, Golden Gate (Rosa Golden Gate). A profusion of large, semi-double, intensely fragrant golden-yellow flowers in large clusters from dark gold buds. Repeat flowering. Healthy foliage. Rose, Highgrove (Rosa Highgrove) (Rosa Hornightshade). Very prolific, subtly fragrant, deep garnet red blooms produced repeatedly over glossy foliage all summer. Climber or shrub. Tolerates semi-shade. Root-Wrapped £9.99 OUT OF STOCK. Rose, Iceberg (Climbing) (Rosa Climbing Iceberg). Abundant clusters of slightly fragrant white to creamy-white roses. Vigorous, thorny stems, glossy leaves, purple in autumn and red hips. Rose, Penny Lane (Rosa Penny Lane) (Rosa Hardwell). Height and Spread; 3m x 2m (9ft x 6ft). Climber. Rose, Scent from Heaven (Rosa Scent from Heaven) (Chewbabaluv). Orange-salmon pointed buds open to classic H.T. shape roses with rich, fruity fragrance. Repeat flowering. Disease resistant. This multiflora rambler is a sight to remember when it is in full bloom. It will be covered from the base of the plant to the top with billowing masses of slightly more than single, pure white, fragrant blooms with pronounced golden stamens which are attractive to bees and butterflies. Although this phenomenon only occurs once in mid-summer there follows a further attraction when the prolific, small, orange-red small hips appear in the autumn. This variety dates back to 1907 and has been popular ever since as a very healthy rose with delicate grass-green foliage and ability to thrive in the shade. It is excellent if planted to ramble into a large tree, or to train against a wall, even north facing. Rose, Starlight Express (Rosa, Starlight Express). This beautiful climbing rose is very vigorous, but only reaches a moderate height when mature and is suitable for climbing against walls, fences, arches and pergolas in open sunny sites. Its healthy dark green foliage is the perfect foil for the abundant clusters of semi-double deep pink scented flowers, which are attractive to bees, and appear over an exceptionally long period from June to September. The flowers have the added advantage of being good for cutting. This rose was launched to support the Great Ormond Street Children’s Hospital. Height and Spread: 2-2½m x 2½m ( 6-8ft x 8ft) . Climber. Rose, Starlight Symphony (Rosa, Starlight Symphony) (Harwisdom). Rose of the year 2019. Soft white open roses with frilled petals, red stamens, gently scented July to Sept. Outstanding disease resistance. Height: 2.7m (8ft 10ins) . Climber. Rose, Wedding Day (Rosa Wedding Day). 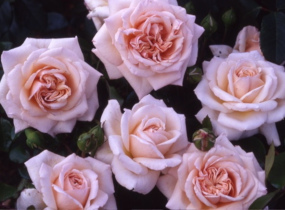 Abundant, large clusters of creamy-white single roses, apricot in bud, with good fragrance July/August. Glossy, mid-green, healthy leaves. Rose, Zephirine Drouhin (Rosa Zephirine Drouhin). One of the best and most reliable climbers coming into flower early and continuing late in the season. Thornless stems and very fragrant, deep cerise-pink flowers in profusion all summer. Flowers pretty in bud opening with unusual frilly petals (Bred by Bizot, France 1868).